I have been doing something a bit crazy lately. I have sketches and sketches in my journal but never seem to put the into color and finish my vision. Funny thing with creative inspiration though… It seems to reach critical mass and then it will bubble over. Well, I have been finishing some of the projects I started and it feels great to finish! This piece was created by actually using white paint over a background I had started. It was too bright to go with the paint swatches I had from the local hardware store. Since the shades were similar, I decided to go nuts and paint over the background. I was so glad I did! 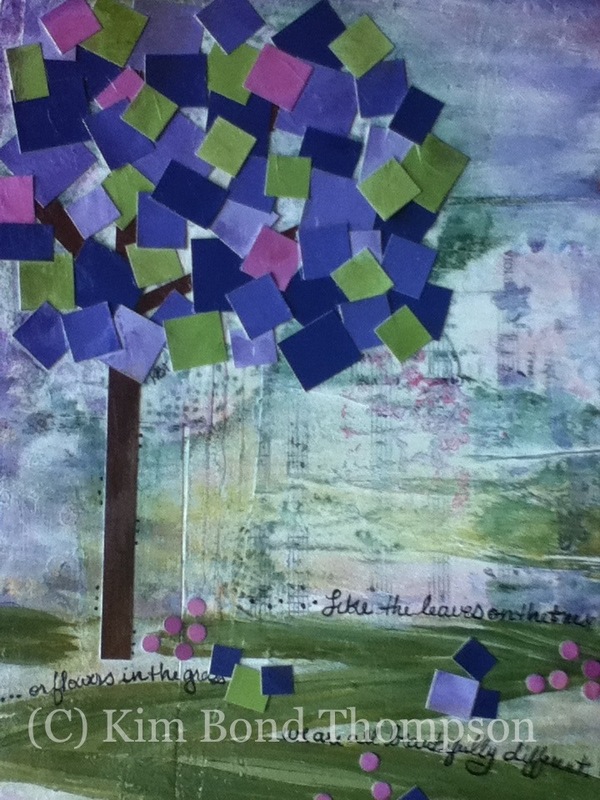 The samples were cut up for the leaves and flowers and acrylic paint and distress ink were used to tie it all together. It was fun to put together and I hope you enjoy it! Aw thanks! I had never painted over a canvas before… But now I may just do it again!